Critics often pound government agencies for not running their organizations more like the private sector does. But in the case of the purchase card program, agencies have been criticized for doing just that. Government purchase cards are credit cards that agency employees use to buy smaller items without going though a lengthy procurement process. The Government Accountability Office issued an audit of the Homeland Security Department’s purchase card program this month that showed some evidence of waste, fraud and abuse. It found a few entertaining cases. The Federal Emergency Management Agency, for example, spent $68,000 on dog booties. Even worse, GAO found that no one used them. The government should prosecute people who misuse purchase cards. Waste, fraud and abuse cost agencies money and diminish one of the most successful parts of procurement reform. It is easy to forget the hoops that government employees had to jump through to make smaller purchases a decade ago. Every purchase required a procurement executive’s involvement, which created a bottleneck. Buying a desktop PC could take months. Without the purchase card program, the situation would be untenable, especially because the government has reduced its procurement workforce. The purchase card program has produced other benefits. It has reduced the costs of purchasing small items, and it has allowed procurement executives to focus on more important areas. But the purchase card program needs careful management. 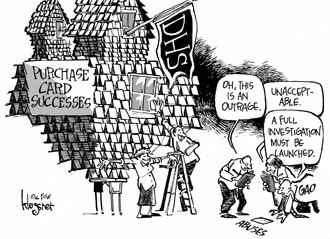 GAO found that the government has thousands of purchase cards, and it recommended that DHS curb waste, fraud and abuse by limiting the number of cards it distributes to employees. Common sense dictates several other steps that agencies should take to ensure that employees don’t abuse the program. When people abuse purchase cards, punish them — by legal action, if necessary. But don’t throw out an entire program because of a few cases. DHS officials responded to GAO’s findings by pointing out that the charges question only 0.14 percent of the department’s $435 million in purchase card buys in fiscal 2005. Less than 1 percent of the employees with cards have required disciplinary action, agency officials said. We hope that the program is as well-run as DHS officials say it is. The loss of such an important tool because agencies failed to manage the program effectively would be disappointing.